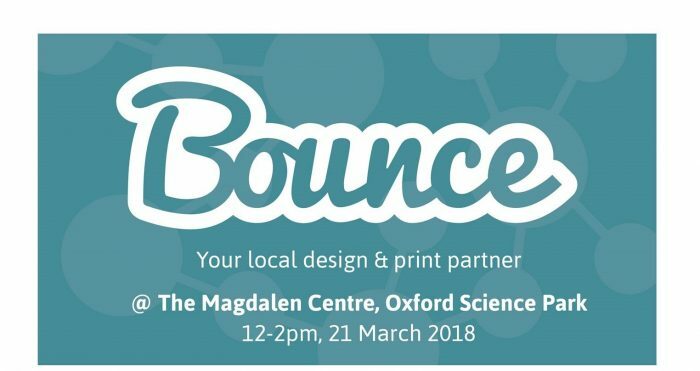 On Wednesday 21st March 2018 between 12pm and 2pm, Sean and Tom from Bounce Design will be holding a pop-up table top event at the Magdalen Centre Reception, Oxford Science Park. Bounce is an Oxford based Design, Print & Art organisation offering over 25 years experience, working with businesses in a variety of sectors including biotechnology, manufacturing, pharmaceuticals and engineering. In addition to this, we work with independent start-up businesses, local artists, and support community events such as the Cowley Road Carnival. We offer a wide range of design services, including branding, logos, brochure/catalogues, as well as many different forms of print; allowing us to provide end-to-end marketing support for your business. We are looking forward to meeting you on the 21st March, to hear about your organisation and any design, print or other marketing communication related requirements you may have. We would be delighted to answer any questions about our products and services. What: Bounce Design, pop-up table top event.